The Atari Lynx has two predominant cartridge styles, and several variations within each of those major styles. All cartridges manufactured by Atari feature plastic cartridges with a color, glossy label on the front. These cartridges appeared in three different styles, although the earlier two are much harder to come by these days. Most common is the Curved Lip style, followed by Flat and finally Ridged. 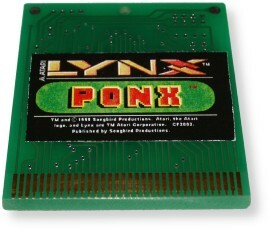 Games that have come out in recent years for the Lynx have foregone the expensive manufacturing process of Atari's sleek, plastic cartridges and instead use an exposed circuit board with a ROM or EPROM soldered directly to the board. There are several different styles of cartridges that use this cheaper manufacturing process. The only games to come in more than one style of cartridge are the first five Lynx games released by Atari. Since these earlier styles were quickly phased out, they are harder to come by than the final Curved Lip style. The Flat and Ridged cartridges are only of interest to collectors, as there is no difference in the games themselves. And if you want to enjoy these earlier games in a real Lynx, you'd probably want to use the final revision, as they are much easier to remove from the Lynx. 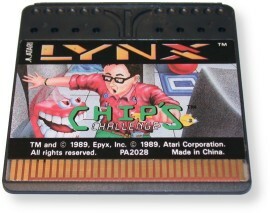 Flat When Atari released the Lynx in 1989, there were five games available: California Games, Blue Lightning, Electrocop, Gates of Zendocon, and Chip's Challenge. These first five games are the only cartridges available in this particular flat cartridge style. These cartrides have a row of dimples on the end of the cartridge and a tiny ridge on the same edge. The dimples allow these cartridges to stack quite well, but unfortunately they were often quite difficult to extract from the original Lynx. The tiny lip on the end of the cartridge might have been useful had it been facing the opposite direction. Atari would soon forego these flat cartridges by adding ridges to the bottom to make them easier to remove. Ridged Quickly after the release of the Lynx, people complained that the cartridges were difficult to remove once inserted. While cartridges were easy to insert, there was no easy to way to grip the cartridges when trying to remove them. In order to address this problem, Atari added two ridges to the back of the cartridge, facilitating much easier removal. From the front, these cartridges are very similar in appearance to the flat cartridge style, except for eight small holes directly opposite the ridges. Unfortunately, the addition of these ridges removed the ability to conveniently stack cartridges. Atari would later switch to a third and final curved lip cartridge style for these and all future Lynx releases. Of the three cartridge styles Atari produced for the Lynx, these Ridged carts are the rarest. 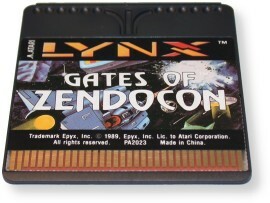 All five of Atari's original Lynx releases were produced in this cartridge style, as well as the later Gauntlet release. Curved Lip This cartridge style was Atari's third for the Lynx, after the flat and ridged styles. This style did away with the dimples on the end of the cartridge and replaced it with a curved lip that bends downwards when looking at the cartridge from the top. This curved lip makes Lynx cartridges much easier to remove than Atari's previous attempts. Atari also removed the embedded fuji symbol on the front of the cartridge, but kept a smaller version of the logo on the back. 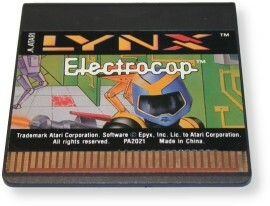 All Lynx games produced by Atari can be found in this cartridge style, including the original five Lynx releases. While these cartridges do not stack very well, they are easier to store than the ridged style. Green PCB 1 This is a green circuit board with what appears to be a hand soldered EPROM on the back side. 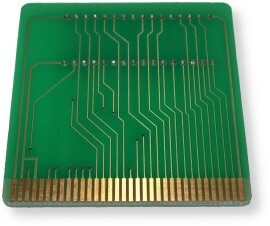 The circuit board is roughly the size of a plastic Lynx cartridge and has rounded corners. The only game that we know of that uses this particular style is Harry Dodgson's Othello. Green PCB 3 These green cartridges also use an exposed circuit board, but are taller in height than previous incarnations. These cartridges feature a much smaller surface mount chip, although there appears to be space on the board for a conventional EPROM. The text, "LC1 REV A (C) SEMAG 1999" is adorned on the same side of the board as the chip. We're only aware of two games that were produced with this cartridge style, both from Songbird Productions. Black PCB These black cartridges appear to be an improvement on the earlier Green PCB 3 style. These cartridges also feature an exposed circuit board with a small, surface mount chip, although most of the board has a black coating. We presume this is to help protect the signal traces as well as better match the color of the original Lynx carts. 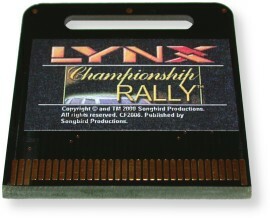 These cartridges feature the text, "LC3 REV A (C) SEMAG 2000", as well as "Long Live the Lynx!" on the side of the cartridge the chip is soldered to. In addition, there is a wide hole at the top of these carts, probably to aid in removing the carts from a Lynx. Songbird Productions is the only company producing cartridges in this style. Green PCB 2 This cartridge style is similar in appearance to the Green PCB 1 style, but there are several differences. These cartridges are slightly shorter in length, are a darker shade of green, and do not have rounded corners. 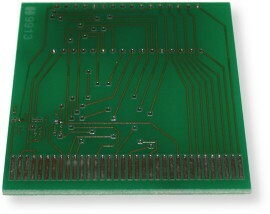 The game's EPROM appears to be hand soldered to the circuit board. The side of the board opposite the EPROM has the number "9913" printed on it. Cartridges in this style were produced only by Telegames and B. Schick.